Airline hubs or hub airports are used by one or more airlines to concentrate passenger traffic and flight operations at a given airport. They serve as transfer (or stop-over) points to get passengers to their final destination. [a][b] It is part of the hub-and-spoke system. An airline operates flights from several non-hub (spoke) cities to the hub airport, and passengers traveling between spoke cities need to connect through the hub. This paradigm creates economies of scale that allow an airline to serve (via an intermediate connection) city-pairs that could otherwise not be economically served on a non-stop basis. This system contrasts with the point-to-point model, in which there are no hubs and nonstop flights are instead offered between spoke cities. Hub airports also serve origin and destination (O&D) traffic. In the airline industry, a focus city is a destination from which an airline operates limited point-to-point routes. Ergo, a focus city primarily caters to the local market rather than to connecting passengers. However, with the term's expanded usage, a focus city may also function as a small-scale or total hub. Allegiant Air, JetBlue and Southwest Airlines are examples of US-based airlines that consider some of their focus cities run like a hub. The hub-and-spoke system allows an airline to serve fewer routes, so fewer aircraft are needed. The system also increases passenger loads; a flight from a hub to a spoke carries not just passengers originating at the hub, but also passengers originating at multiple spoke cities. However, the system is costly. Additional employees and facilities are needed to cater to connecting passengers. To serve spoke cities of varying populations and demand, an airline requires several aircraft types, and specific training and equipment are necessary for each type. In addition, airlines may experience capacity constraints as they expand at their hub airports. For the passenger, the hub-and-spoke system offers one-stop air service to a wide array of destinations. However, it requires having to regularly make connections en route to their final destination, which increases travel time. Additionally, airlines can come to monopolise their hubs (fortress hubs), allowing them to freely increase fares as passengers have no alternative. Airlines may operate banks of flights at their hubs, in which several flights arrive and depart within short periods of time. The banks may be known as "peaks" of activity at the hubs and the non-banks as "valleys". Banking allows for short connection times for passengers. However, an airline must assemble a large number of resources to cater to the influx of flights during a bank, and having several aircraft on the ground at the same time can lead to congestion and delays. In addition, banking could result in inefficient aircraft utilisation, with aircraft waiting at spoke cities for the next bank. Instead, some airlines have debanked their hubs, introducing a "rolling hub" in which flight arrivals and departures are spread throughout the day. This phenomenon is also known as "depeaking". While costs may decrease, connection times are longer at a rolling hub. American Airlines was the first to depeak its hubs, trying to improve profitability following the September 11 attacks. It rebanked its hubs in 2015, however, feeling the gain in connecting passengers would outweigh the rise in costs. The hub-and-spoke system is also used by some cargo airlines. FedEx Express established its main hub in Memphis in 1973, prior to the deregulation of the air cargo industry in the United States. The system has created an efficient delivery system for the airline. Other airlines that use this system include UPS Airlines, TNT Airways, Cargolux and DHL Aviation, which operate their primary hubs at Louisville, Liège, Luxembourg and Leipzig respectively. Although the term focus city is used to mainly refer to an airport from which an airline operates limited point-to-point routes, its usage has loosely expanded to refer to a small-scale hub as well. For example, JetBlue's New York–JFK focus city runs like a hub, although in reality it is still deemed[by whom?] as a focus city. A fortress hub exists when an airline controls a significant majority of the market at one of its hubs. Competition is particularly difficult at fortress hubs. Examples include Delta hubs at Atlanta, Salt Lake City, Detroit and Minneapolis–Saint Paul; American Airlines hubs at Charlotte, Dallas–Fort Worth, Washington-National, and Philadelphia; and United hubs at Denver, San Francisco, Houston–Intercontinental, Newark, and Washington–Dulles. Flag carriers have historically enjoyed similar dominance at the main international airport of their countries and some still do. Examples include Lufthansa at Frankfurt Airport, Air Canada at Toronto Pearson Airport, Alitalia at Rome Fiumicino Airport, KLM at Amsterdam Airport Schiphol, Garuda Indonesia at Soekarno-Hatta International Airport, British Airways at London Heathrow, Air China at Beijing Capital Airport, Iberia at Madrid-Barajas Airport and Air France at Paris Orly and Charles de Gaulle Airports. A primary hub is the main hub for an airline. However, as an airline expands operations at its primary hub to the point that it experiences capacity limitations, it may elect to open secondary hubs. Examples of such hubs are Turkish Airlines' Istanbul–Sabiha Gökçen hub, British Airways' hub at London-Gatwick, Air India's hub at Mumbai and Lufthansa's hub at Munich. By operating multiple hubs, airlines can expand their geographic reach. They can also better serve spoke–spoke markets, providing more itineraries with connections at different hubs. A given hub's capacity may become exhausted or capacity shortages may occur during peak periods of the day, at which point airlines may be compelled to shift traffic to a reliever hub. A reliever hub has the potential to serve several functions for an airline: it can bypass the congested hub, it can absorb excess demand for flights that could otherwise not be scheduled at the congested hub, and it can schedule new O&D city pairs for connecting traffic. One of the most recognized examples of this model is Delta Air Lines's use of LaGuardia Airport as a domestic hub in New York City, due to capacity and slot restrictions at its hub at John F. Kennedy International Airport. Many regional flights operate out of LaGuardia, while most international flights remain at JFK. A scissor hub occurs when an airline operates multiple flights to an airport that arrive at the same time, swap passengers, and then continue to their final destination. Air India operates a similar scissor hub at London's Heathrow Airport, where passengers from Delhi, Ahmedabad, and Mumbai can continue onto a flight to Newark. An international scissor hub could be used for third and fourth freedom flights or it could be used for fifth freedom flights, for which a precursor is a bilateral treaty between two country pairs. WestJet Airlines uses St. John's as a scissor hub during its summer schedule for flights inbound from Ottawa and Toronto and outbound to Dublin and London Gatwick. At Los Angeles International Airport, Qantas' passengers from Melbourne, Brisbane or Sydney may transfer onto a flight to New York-JFK and vice versa. In past history, carriers have maintained niche, time-of-day operations at hubs. The most notable is America West's use of McCarran International Airport in Las Vegas as a primary night-flight hub to increase aircraft utilization rates far beyond those of competing carriers. In 1974, the governments of Bahrain, Oman, Qatar and the United Arab Emirates took control of Gulf Air from the British Overseas Airways Corporation (BOAC). Gulf Air became the flag carrier of the four Middle Eastern nations. It linked Oman, Qatar and the UAE to its Bahrain hub, from which it offered flights to destinations throughout Europe and Asia. In the UAE, Gulf Air focused on Abu Dhabi rather than Dubai, contrary to the aspirations of UAE Prime Minister Mohammed bin Rashid Al Maktoum to transform the latter into a world-class metropolis. Sheikh Mohammed proceeded to establish a new airline based in Dubai, Emirates, which launched operations in 1985. Observing the success of Emirates, Qatar and Oman decided to create their own airlines as well. Qatar Airways and Oman Air were both founded in 1993, with hubs at Doha and Muscat respectively. As the new airlines grew, their home nations relied less on Gulf Air to provide air service. Qatar withdrew its share in Gulf Air in 2002. In 2003, the UAE formed another national airline, Etihad Airways, which is based in Abu Dhabi. The country exited Gulf Air in 2006, and Oman followed in 2007. Emirates, Qatar Airways and Etihad Airways have since established large hubs at their respective home airports. The hubs, which benefit from their proximity to large population centres, have become popular stopover points on trips between Europe and Asia, for example. Their rapid growth has impacted the development of traditional hubs, such as London, Paris, and New York City. Before the US airline industry was deregulated in 1978, most airlines operated under the point-to-point system (with a notable exception being Pan Am). 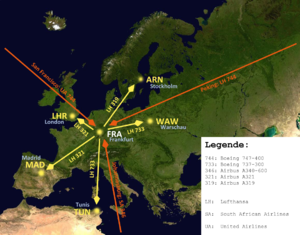 The Civil Aeronautics Board dictated which routes an airline could fly. At the same time, however, some airlines began to experiment with the hub-and-spoke system. Delta Air Lines was the first to implement such a system, providing service to remote spoke cities from its Atlanta hub. After deregulation, many airlines quickly established hub-and-spoke route networks of their own. ^ Colloquially, an airline hub may be defined as an airport that receives a large number of passengers or as an airport that serves as the operating base of an airline, whether or not the airline allows for connecting traffic. ^ The Federal Aviation Administration of the United States defines a hub in terms of passenger enplanements. Specifically, a hub is an airport that handles 0.05% or more of the nation's annual passenger boardings. ^ a b c Holloway, Stephen (2008). Straight and Level: Practical Airline Economics (3rd ed.). Ashgate Publishing. pp. 376, 378. ISBN 9780754672562. Archived from the original on 2018-05-08. ^ "Airport Categories". Federal Aviation Administration. 2016-03-03. Archived from the original on 2016-05-28. Retrieved 2016-05-30. ^ a b "The JetBlue focus cities" (PDF). JetBlue. Archived from the original (PDF) on 2015-02-18. Retrieved 2016-05-26. ^ a b Mammarella, James (2014). "Airport Hubs". In Garrett, Mark (ed.). Encyclopedia of Transportation: Social Science and Policy. SAGE Publications. ISBN 978-1-4522-6779-1. Archived from the original on 2018-05-08. ^ Heilman, Wayne (2012-04-20). "Springs is Frontier's new front in battle for Colorado travelers". The Gazette (Colorado Springs). Archived from the original on 2016-05-26. Retrieved 2016-05-26. ^ Mutzabaugh, Ben (2006-03-03). "United adds a 'hublet' in San Antonio". USA Today. Archived from the original on 2016-05-26. Retrieved 2016-05-26. ^ Mutzabaugh, Ben (2014-03-21). "Frontier Airlines tabs Cleveland as newest focus city". USA Today. Archived from the original on 2016-06-24. Retrieved 2016-05-26. ^ a b c d Cook, Gerald; Goodwin, Jeremy (2008). "Airline Networks: A Comparison of Hub-and-Spoke and Point-to-Point Systems". Journal of Aviation/Aerospace Education & Research. Embry–Riddle Aeronautical University. 17 (2): 52–54. Archived from the original on 2015-09-23. Retrieved 2016-05-28. ^ a b c d "Airline Deregulation and Hub-and-Spoke Networks". The Geography of Transport Systems. Hofstra University. Archived from the original on 2016-04-05. Retrieved 2016-05-28. ^ Schmidt, William (1985-11-14). "Deregulation Challenges Atlanta Airline Hub". The New York Times. Archived from the original on 2015-05-24. Retrieved 2016-05-28. ^ a b c Lawrence, Harry (2004). Aviation and the Role of Government. Kendall Hunt. pp. 227–228. ISBN 9780757509445. ^ a b c Maxon, Terry (2015-03-27). "American Airlines banking on tighter connections". The Dallas Morning News. Archived from the original on 2016-06-24. Retrieved 2016-05-30. ^ a b c d e Belobaba, Peter; Odoni, Amedeo; Barnhart, Cynthia, eds. (2016). The Global Airline Industry. Chichester, England: John Wiley & Sons. pp. 142, 172–174. ISBN 9781118881170. Archived from the original on 2018-05-08. ^ a b Reed, Dan (2002-08-08). "American Airlines to try rolling hubs". USA Today. Retrieved 2016-05-30. ^ Scholes, Kevan (2004). Federal Express – delivering the goods (PDF) (Report). Pearson PLC. Archived from the original (PDF) on 2014-06-11. Retrieved 2016-05-29. ^ "Hubs of Major Air Freight Integrators". The Geography of Transport Systems. Hofstra University. Archived from the original on 2016-04-12. Retrieved 2016-05-29. ^ Mammarella, James (2014). "Airport Hubs". In Garrett, Mark (ed.). Encyclopedia of Transportation: Social Science and Policy. SAGE Publications. ISBN 9781452267791. Archived from the original on 2018-05-08. ^ Rose, Mark; Seely, Bruce; Barrett, Paul (2006). The Best Transportation System in the World: Railroads, Trucks, Airlines, and American Public Policy in the Twentieth Century. Columbus, Ohio: The Ohio State University. p. 233. ISBN 9780812221169. Archived from the original on 2018-05-08. ^ Credeur, Mary; Schlangenstein, Mary (2012-05-03). "United Fights Southwest in Texas to Keep Grip on Busy Hub". Bloomberg L.P. Archived from the original on 2016-05-29. Retrieved 2016-05-28. ^ Thompson, David; Perkins, Stephen; van Dender, Kurt; Zupan, Jeffrey; Forsyth, Peter; Yamaguchi, Katsuhiro; Niemeier, Hans-Martin; Burghouwt, Guillaume (2014). "Expanding Airport Capacity in Large Urban Areas". ITF Round Tables. ITF Round Tables. OECD Publishing (153): 151–152. doi:10.1787/2074336x. ISBN 9789282107393. Archived from the original on 2018-05-08. Retrieved 2016-05-29. ^ McWhirter, Alex (2015-11-27). "Jet Airways to axe Brussels hub". Business Traveller. Archived from the original on 2015-12-12. Retrieved 2016-05-29. ^ "Ahmedabad to Newark via London". www.airindia.in. Archived from the original on 7 March 2018. Retrieved 8 May 2018. ^ a b c Al-Sayeh, Karim (2014). The Rise of the Emerging Middle East Carriers: Outlook and Implications for the Global Airline Industry (PDF) (MSc thesis). Massachusetts Institute of Technology. pp. 25–26, 28. Archived from the original (PDF) on 2016-05-29. Retrieved 2016-05-28. ^ Kindergan, Ashley (2015-01-02). "Revisiting: The Rise of the Gulf Carriers". The Financialist. Credit Suisse. Archived from the original on 2016-04-21. Retrieved 2016-05-28. ^ Dewey, Caitlin (2013-03-05). "The changing geography of international air travel". The Washington Post. Archived from the original on 2016-08-08. Retrieved 2016-05-28. ^ "USB3 hubs in 2017 – American Airlines chops, Delta Air Lines stagnates, United Airlines…is doing O.K." Airline Network News & Analysis. 20 Dec 2017. ^ "2016 North American Airport Traffic Summary (Passenger)". Airports Council International, North America. Aug 2018. ^ "Sea–Tac Airport Annual Activity Report". Port of Seattle. April 15, 2018. Retrieved July 22, 2018.